Co-organisers Running Into The Sun (RITS) and Woohoo! Experience are pleased to announce Xpax, Celcom Axiata Berhad’s main prepaid brand for youth, as the presenter for the “G-Dragon 2013 1st World Tour: One Of A Kind” in Malaysia concert. All Celcom prepaid and postpaid customers will be entitled to a 20% discount off tickets when they purchase a minimum of two Cat 2 (RM488) or Cat 4 (RM188) tickets from 20th– 26th May 2013. Celcom prepaid and postpaid customers will only have to flash their mobile phones to enjoy this discount. This promotion is only valid for purchases made at Ticketcharge or Redtix outlets. Xpax customers also stand to win more tickets and merchandise by purchasing reloads, subscribing to broadband data plans, or downloading content and apps from The Cube – Celcom’s own branded multimedia channel. Best of all, customers who switch from their current provider to Celcom between 20th May to 13th June will stand a chance to win tickets, concert rehearsal passes, a G-Dragon themed fashion makeover, and a grand prize trip to Korea worth RM10,000 for two. G-Dragon 2013 1st World Tour: One Of A Kind” in Malaysia concert tickets launched on 11th May 2013, and VIP tickets sold out within an hour, leaving limited Cat 3 tickets, as well as Cat 2 and Cat 4 tickets for sale. Merchandise enjoyed brisk sales during the ticket launch, and limited stocks are available for pre-sale on the RITS website. 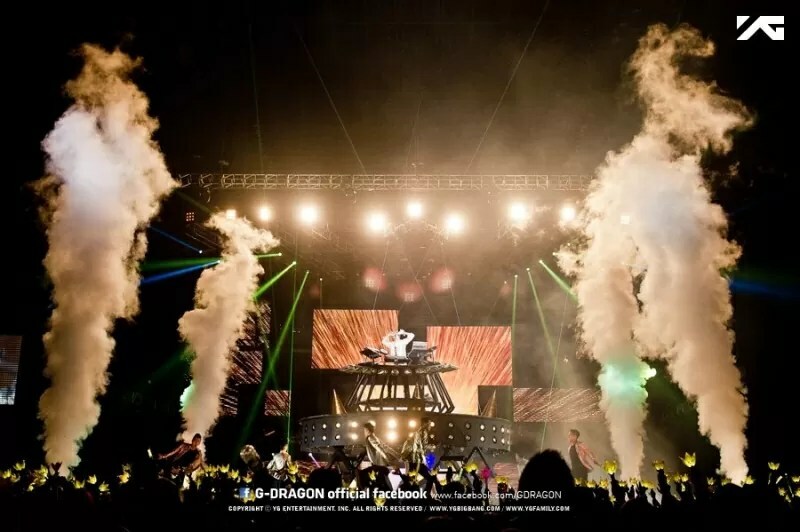 Fans and media alike have been abuzz with excitement about G-Dragon’s Malaysian stop, and RITS and Woohoo! Experience are pleased to have Acer and Intel as the main sponsors for this eagerly-awaited concert. 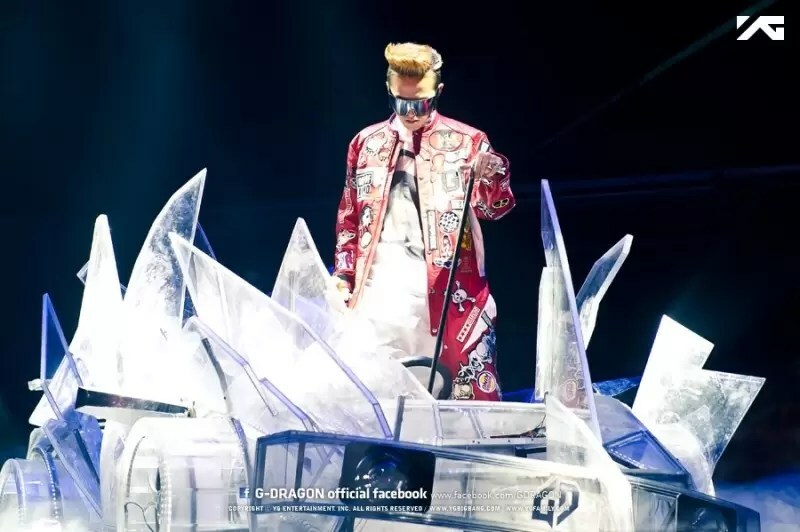 G-Dragon, the leader of global superstars BIGBANG who put on an explosive performance here at their one-night only concert last year, will be holding his first-ever solo concert in Malaysia at Stadium Nasional Bukit Jalil on 22nd June 2013, 8pm. This will be the only outdoor concert of his tour, and Malaysian fans can look forward to an exhilarating night of high-energy performances bolstered by this unique open-air experience and the roaring support of thousands of partying fans. Boasting exquisite sets and props, including a glamorous glass car, along with visually stunning pyrotechnics, lasers and aerial stage stunts, fans can anticipate a truly fantastic feast sure to enthrall the senses. With dazzling choreography by renowned choreographers Travis Payne and Stacey Walker, both of whom worked extensively on Michael Jackson’s “This Is It” tour, audiences can look forward to adrenaline-charged performances by G-Dragon and his crew. 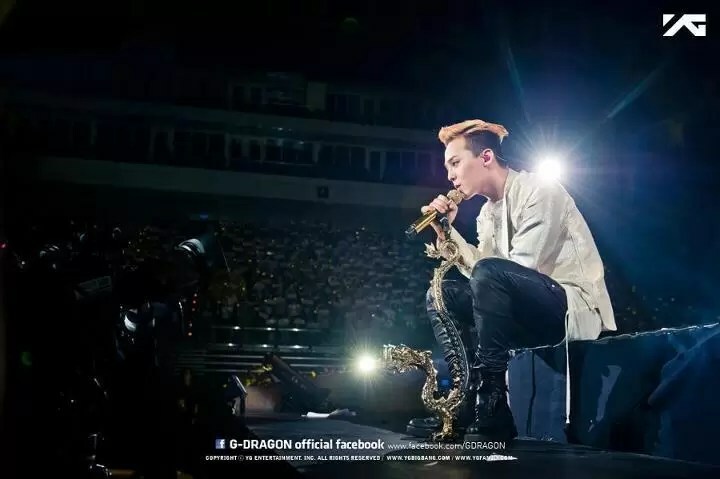 G-Dragon will be staging 26 concerts in 13 cities across 8 countries, drawing over 550,000 fans to his shows. This tour marks the first time that a Korean solo artiste will be holding concerts in four of Japan’s domes. 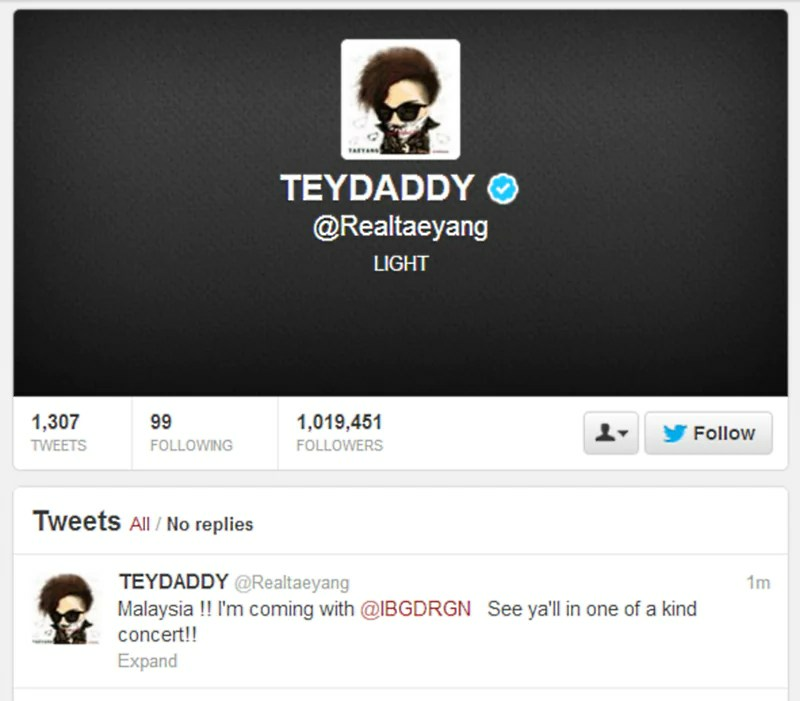 Moments ago, BIGBANG’s Taeyang confirmed via Twitter that he’ll be rockin’ up to Kuala Lumpur, Malaysia for G-Dragon’s “1st World Tour: One Of A Kind” in Malaysia! For more information, hit up Running Into The Sun’s website or their Facebook page. Upload An Instagram Video, Stand A Chance To Win G-Dragon Concert Tickets!